The M4V movies you purchased from iTunes Store are DRM protected and you can only play them on iTunes, iPod, iPhone, iPad and Apple TV. What's more, there is a limitation of playing on five computers. If you want to play the M4V videos on Archos, Creative Zen, iRiver, Sandisk Sansa or Xbox 360, you should first convert M4V to AVI to remove the DRM protection. M4V Converter Plus can help you, which is a powerful iTunes M4V Converter to convert iTunes M4V to AVI at high speed and with great quality. After conversion, you are able to enjoy the converted videos anytime and anywhere freely. When M4V Converter Plus is launched, iTunes will run automatically, so you can add the M4V files directly. 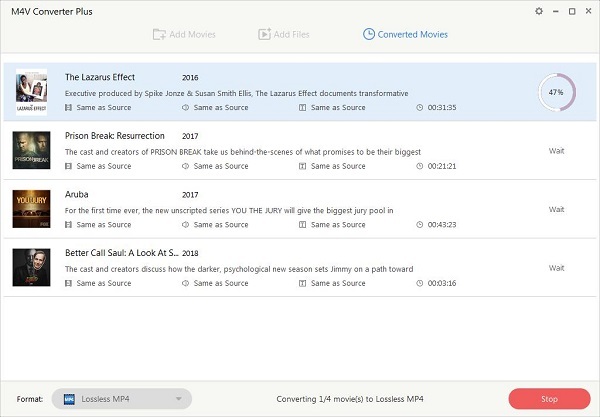 During the converting process, M4V Converter records the M4V files quickly and then encodes to AVI. Compared with other M4V converter software, its output quality is much more higher. Step 1. Import M4V files. 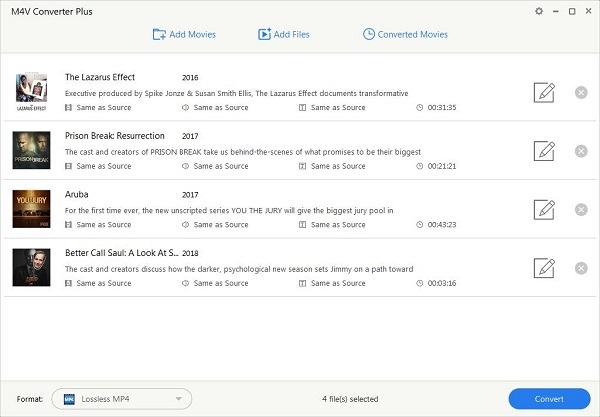 Add M4V files by clicking "Add Movies" button. All the selected M4V videos will be shown in the file list. Step 2. Set the output format as you like. You can choose the output format in the profile drop-down menu. AVI format is supported by many portable video players, such as Archos, Creative Zen, iRiver, Sandisk Sansa and Xbox 360. 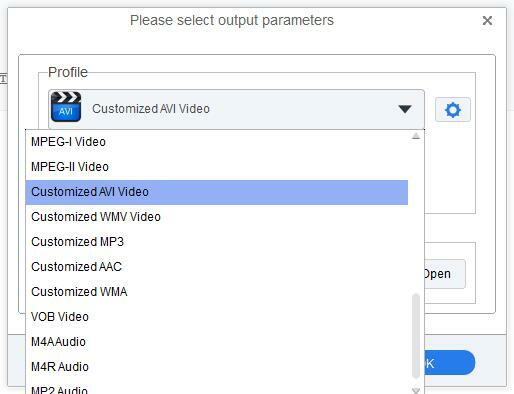 Here you can choose "Customized AVI Video". Tips：All the output formats are customized and you don't need to change them unless you have some special needs. And you can use the default output path. Step 3. Start M4V to AVI conversion. You can click Profile panel to start conversion since all the pre-works have been finished. The videos will be converted one by one. After conversion, you can enjoy your AVI movies on your Archos, Creative Zen, iRiver, Sandisk Sansa and Xbox 360 with freedom. Besides AVI, M4V Converter Plus can also convert DRM protected M4V to MPG, MP4, 3GP, 3G2 or FLV for iPod, iPhone, iPad, Apple TV, Gphone, PSP, PS3, Walkman, Zune, Mobile Phone, BlackBerry, Nokia etc.